Other than its bucolic setting in the Berkshire mountains, Lee Elementary seems like any other public school. Case in point: On a recent morning, as children were scuttling to classes, stuffing their backpacks in their lockers, the loudspeaker announced the day’s taco-salad lunch and reminded students to apply for the talent show. But around the building, there are some unusual touches. For instance, there is a ubiquitous five-point scale; each number corresponds to a mood with a smiley or frowny face. 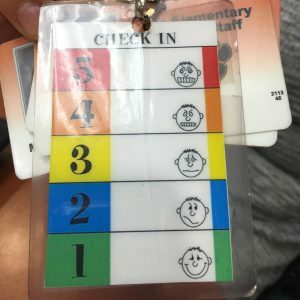 Whenever students enter a room, they tap the number that reflects their mood. “If you’re three or above, you need to seek help from an adult,” said Principal Kate Retzel. As she was explaining this approach towards stressed-out kids, she got a call on her walkie-talkie that illustrated the point. Another administrator asked for her help for a “runner,” a student trying to leave the building. Despite the many arts and tourist venues of Berkshire County, rates of unemployment, poverty and opioid abuse have been rising. That’s why Retzel has spent the last year trying to turn Lee Elementary into what’s called a “trauma-informed” school. The goal is to train the whole staff to be attuned to stress in children’s lives. “People who have been around education for a long time thought it was all behavior-based, that this was all a choice,” Retzel said. “But now that we know that it’s all brain-based, we know that there are things that we can do.” She got this idea in part from a local campaign called “Trauma-Informed Berkshires” — which is aimed at the entire community, from police to libraries to educators.